*Personalized Departures begin on any day of the week that you choose. Included Accommodations, breakfasts, 2 dinners, welcome lunch, picnic lunch, land transfers, wine tasting. Your guide meets you in Florence and brings you into the Chianti countryside. Walk in the hills above Greve. After lunch, taste wines at one of the new high tech cantinas specializing in a variety of the Super Tuscans. For trips beginning on Saturday you’ll experience a typical market day in Greve. Next, its off to Radda, your home for the next two nights. There is ample time to check in and relax before a dinner of traditional Tuscan fare. Following an Italian buffet breakfast, your guide will take you on a walk around Radda and help you prepare a perfect picnic lunch from produce in the local shops. We’ll enjoy our picnic together in the countryside where we’ll wander on carefully selected paths passing farms and vineyards. In the afternoon we’ll visit the Castello di Brolio before returning to Radda for the evening. This is evening we encourage you to discover this typical Chianti town on your own and try one of the local restaurants. Our guide can help you pick the perfect dinner spot. This morning we transfer to Sienna, one of Tuscany’s most beautiful Medieval towns. Our guide will take you to the main Piazza (square) renowned throughout the world for its famous palio or horse races. Lunch today is on your own but there are many places to choose from. We suggest you sit in an outdoor trattoria and savour the architecture and watch locals chatting on the street. In the afternoon we transfer to Montalciono. After checking into our digs for the next 2 nights, we’ll have an orientation walk around the town. Today you are in for a treat. Our walk from Montalcino to Sant’Antimo takes us through picture-perfect roads. Originally built by the enigmatic Etruscan, part of the road network is the original “all roads lead to Rome.” You may be lucky enough to see grazing chianine, the porcelain white cows famed for the meat the produces the Fiorentine steak. 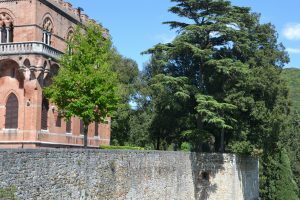 San’t Antimo is a Benedictine monastery of Romanesque design that is still operational. We will return to Montalcino in the late afternoon and you will have time to wander on your own. Today we transfer to San Quirico for a walk to Pienza . We’ll visit the stunningly perfect Renaissance town, surrounded by the iconic hills and towering cypress trees that makes Tuscany famous. You’ll have time to wander through cheese shops and taste some pecorino, cheese made with sheep’s milk. Yummm! In the afternoon we return to Montalcino. After some rest and relaxation join us for a farewell dinner. Following an early morning breakfast, our guide takes you to the train station in Florence where you transfer to your next destination. INCLUDED: Pick up and drop off in Florence, full time guide for each day, hotel, hotel taxes and gratuities, all breakfasts, all dinners, one lunch, guided walks in Siena, guided walks on country footpaths, wine tasting where indicated, specialty food tasting, luggage transfers. NOT INCLUDED: Airfares, airport taxes, travel insurance (mandatory), pre and post trip arrangements, personal purchases, mini-bar services, alcohol unless specifically included, wines where not indicated as included, consumer protection, gratuities for guide and driver. * Personalized Departure Dates: We can customize any of our trips to begin on a date that is convenient for you and your friends. We can change the hotels, extend the trip and more. Custom trips are priced based on request. Prices are based on your hotel selection.